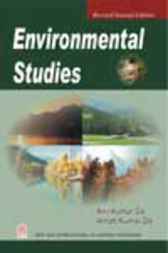 About the Book: This book is designed in terms of the UGC guidelines for the common course on Environment/Environmental Studies for the undergraduate students of various streams (B.A., B.Sc., B.Com., etc.) in colleges and universities. First published in 2001, the book has been updated and thoroughly revised in the form of the Second Edition. It is hoped that the book will be found extremely interesting and useful by the teachers and students concerned for the common course. Highlights of the book: Simple and lucid presentation of environment (physical and human) Only essential scientific terms included and explained throughout the text Glossary of key terms included in each chapter for better understanding of the subject Feedback Exercises in the last chapter for testing the knowledge of the subject. The book, with a new look, is destined to carry forward its mission of promoting environmental education among the students. Contents: Introduction Nature and Natural Processes Ecosystems Population and Environment Land and Water Resources of the Earth Air Resource Energy and Environment Environment and Public Health Waste Treatment/Management and Recycling Environmental Policies Feedback Exercise (Objective Test).